Matariki – a seven star cluster appearing pre-dawn in the North-Eastern sky in late June early July, for many, marks the Māori New Year. Traditionally, Matariki was a time of sustainability – to prepare the land for planting crops and renew associations with whanau and friends. Today, Matariki is a good time for us to reflect on our place in the world, to reawaken dreams and inspire awareness of our fragile environment. Te Awamutu Museum will be marking this Matariki 2017 by bringing back a popular series of creative workshops themed around sustainability. 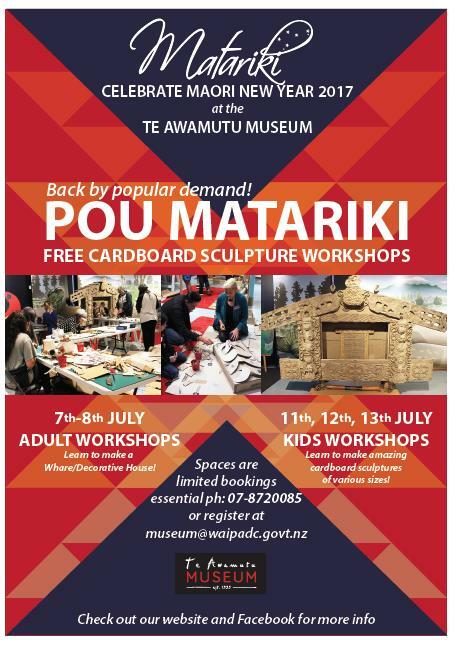 Pou Matariki sees artists Emanuel Dunn and Oriwa Morgan-Ward presenting adult and children sculptural workshops using cardboard in the Museum this July. “The challenge is to create a taonga out of things that we as humans discard. We want to place importance on the act of creativity as a way to heal ourselves, and by doing so, we in turn are healing our environment. The greatest thing about this process is that we get to share it with others”. The workshops will run over two weeks with the adult workshops being held over two days – Friday 4th July 3pm-6pm & Sat 8th July 10am-3pm. The children’s workshop series will occur Tuesday 11th, Wed 12th & Thurs 13th July from 10am-3pm daily. Please book your preferred day at our Museum reception on 07 8720085 or via email museum@waipadc.govt.nz. There will also be an Artist Floor Talk on Friday 14th July from 3pm. Emanuel and Oriwa will be showcasing various artworks they have been working on as well as a representative from the Waipa District Council talking about various ways to reduce and redirect waste from landfill.